Cuccu - thanoscardgamess jimdo page! Cuccù (or Cöch) is an easy to learn and enjoyable Italian partnership trick-taking game for four players and is played with the special 40-card Cuccu deck. 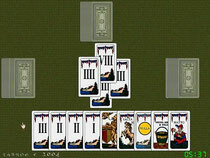 The cards have point values and the object is to take tricks containing valuable cards. There is a total of 19 points in the game. The deck consists of 20 pairs of identical cards - 40 cards altogether. The cards are divided into two suits of 20 cards, The dealer deals 10 cards to each player and there are no trumps.